Our size chart is a guide to help you select the best size. BUGBite holsters are made of a light breathable Neoprene that has a snug stretchy comfortable fit. 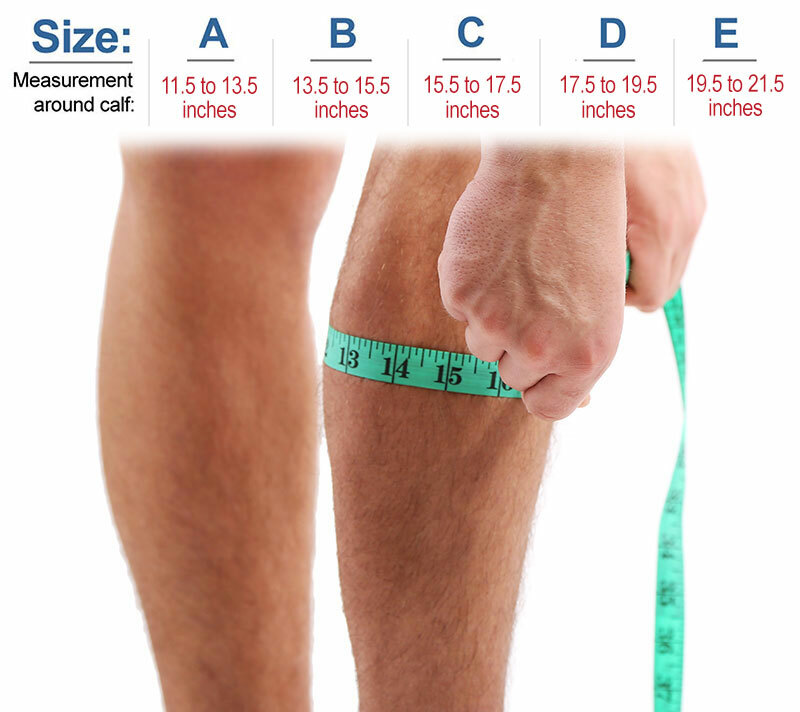 The size chart is a good guide but much like any garment regardless of what size you are, fit is a matter of personal preference and can vary depending on how a leg is shaped, how muscular the calf is or not. If you are right between sizes. If your measurement falls between two sizes, we suggest going up in size. Fit is in part a matter of personal preference, if when you receive your order you feel a different size would be a better and more comfortable fit, please let us know and we will be happy to help with an exchange. When I first received the Bugbite, I tried it with nothing in its pockets, leaving it on for about 2-3 minutes. It felt really tight and uncomfortable; however, all the reviews I had read talked about how comfortable it was. So, the next day, I decided to really give it a fair trial. I slipped it on, ‘filled it up,’ and wore it for over 8 hours. After about 5 minutes, I honestly could not tell I was wearing anything on my leg! In fact, twice during the day, I actually reached down to make sure my pistol was still in the holster, as I had no sensation of anything being attached to my leg. The holster stays in place and doesn’t slip. The pistol stays in place, also. I ran full out for a one-block distance with no slippage of holster or movement of pistol. I’m sure that the holster will be warm once summer hits Texas, but I would be wearing long pants less often and using my pocket holster more. I could not be happier with my Bugbite! I’m considering buying a second one, just in case they should stop carrying the size for my pistol. I think this is the 5th ankle holster I've tried, and is by far the best. It's definitely the most comfortable, and stays up better than any of the others. I highly recommend it! I’ve only tried it on a couple times so far, since I need to get my CC Permit. Seems very well made & comfortable. Only reason I didn’t give 5 Stars ⭐️ is because I haven’t worn it for any length of time. I think it’s going to be good ! I am s fan... you've done a best job south this... only one thing needed... a thumb break strap that will also stretch to cover different size weapons. As a medic. I wore your holster 6 shifts now never knew my sig was there. But my job ac nd moving like we do requires a scrap for extra placement hold in the holster. But other than this fix for us. This has been greatest holster ever... wore all 24hrs each shift. I purchased this holster purely for the way that it appeared to be designed. I was apprehensive about the materials being stout enough to hold a firearm without sagging. While I don't use an ankle holster often, I have found the Bugbite to be very stable, concealable, and above all comfortable. It does everything I expect of any holster and at the same time is extremely comfortable. Thank you for maki g a great product. Did not conceal quite as well as I thought it would. 3rd time I wore it I got a rash on my leg, not sure why that happened. Is well made, and I am being probably a little harsh in my rating. Outstanding leg holster. Stays exactly where you secure it all day.. I got the bugbite ankle holster to carry my bug, a Bodyguard 380. Very comfortable and conceals well. I would recommend this to anyone looking for an ankle holster.